The Republican Party has a problem attracting millennials. Is it because we’ve lost our way of being the party of fiscal responsibility? Is it because we’re too concerned with social issues? Is it because of dissatisfaction with the status quo? Is it because the Republican Party acts more like the little brother of the Democratic Party, voting lock step with them along the way to ensure the socialist takeover of America? Millennials are a huge chunk of the voting bloc, representing around 80 million people and are some of the most idealistic voters out there. Young people love to see the world as their oyster, as they set out to fulfill their version of the American Dream; seeking a life where they control their own destiny, much like their forefathers did when they first came to the United States. They seek a life where they are financially stable, free and ultimately, rich. Millennial republicans are skeptical of government and it’s inefficiency in the market place. According to a Pew Research survey, sixty eight percent of millennials say that government cannot afford to help the needy and about six in ten millennial republicans said that government is almost always wasteful. Millennials also support slashing spending and cutting taxes. According to a Reason-Rupe survey, 65% of millennials support cutting government spending and 58% supported cutting taxes. Young people are tired of big government. The Republican Party, although the establishment begs to differ, is supposed to stand for less government and more economic freedom. Yet at the same time, young people are much more open to different lifestyles than the older Republican Party. According to a Pew Research survey, eighty four percent of millennial support gay marriage and two thirds of millennial support the legalization of weed. According to a YouGov poll, one in five millennials consider themselves to be libertarian. Lastly, young people are tired of being lied to. 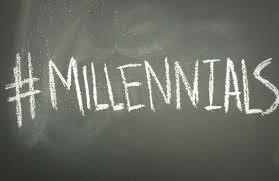 Millennials are much like the Tea Party and grass-root movements; focused on holding their leaders accountable. People all across the age spectrum are tired of "do-nothing" politicians and this is certainly the case for young people. According to a Generation Opportunity poll, 69% of young adults believe that the current leadership in Washington failed to represent the interests of young people. Young people are more inclined to support principled candidates, on both sides of the spectrum, as more young people on the left are flocking to help get Democratic Socialist Bernie Sanders elected over establishment candidates like Hillary Clinton. And on the right more young people on the right are aiding in the campaigns of Rand Paul and Ted Cruz. Young people are idealistic and they want someone to represent their views in a way that the current establishment politicians have not been able to do. People, especially young people, are tired of being told what to do with their money, how to live their lives and are tired of being lied to. If the GOP wants to grow their base, pandering to the left and playing Democrat-lite is not going to help. There is a market for young, idealistic, millennial republicans with libertarian streaks running through their veins. The plan is not just for young people, it’s for Americans tired with the status quo in Washington, for the Tea Party, for conservatives, for victory.